Cruises are by far one of the best family reunion ideas. Why? Here are my top 10 reasons. As a group leader, you can qualify for a free cruise. For a minimum of 16 passengers (8 cabins double occupancy) traveling together on the same ship and same sailing date, one person gets to cruise for free. Or if you have 32 passengers (16 cabins), then you would get 2 free cruise passages (one free cabin) and so on. You'll need to check with the cruise lines for their rules. They will assist you with all the reservations. They can even help you plan on board events or arrange special family reunion activities. Cruise lines offer special amenities just for your group, such as complimentary champagne and chocolates, or a private cocktail party onboard. All accommodations, all meals, activities on board the ship, and entertainment. No cooking, no cleaning, no driving, no gas bills, no grocery shopping. Unpack once and let your floating hotel take you away. Cruises are amongst the best family reunion ideas because they offer something for everyone, no matter what age group. And you don't have to organize any of it, you just get the free cruise! How about: rock climbing walls; ice-skating rinks; roller blade tracks; swimming pools; hot tubs; gym; movie theaters; Internet cafes; sports bars; libraries; video arcades; kids programs; spa services; shopping; gambling; cooking classes; enrichment seminars; guest lecturers; computer classes; dancing lessons; Las Vegas style shows; comedians. Now that's entertainment! I'm sure not every one has the same budget. A cruise is the best family reunion idea because the group discounts apply to all the different types of staterooms (cabins) available on a ship namely, suites, balcony and oceanview staterooms, and inside cabins. Unlike restaurants on land, the ship's dining room can accommodate all group sizes. The staff is trained accordingly. Every night, your group can enjoy their meals together. During the day, as everyone goes their own way, the indoor buffet, the outdoor grill, the pizza parlor or even the dining room are available. Caribbean cruises operate all year round so you have a better chance of finding a date suitable for everyone. I know that Carnival Cruise Line Group department will help you design custom shore excursions that are perfect for your family reunion. Do you agree with me that a cruise is one of the best family reunion ideas, even one of the best vacation ideas? What better way to gather up all the moms, dads, brothers, sisters, cousins and kids from all over! I've talked to people who were part of a family reunion and they were thrilled because they got to meet their cousins whom they have never met before because they lived in Germany and England. Imagine celebrating grandma's 80th birthday on a cruise where all her family is there for a whole week...what a nice gift for her. I have seen many groups aboard the many ships we have sailed on and they were noticeable because they were wearing custom T-shirts, especially at embarkation. Some had their family name printed on the front and others even mentioned the special occasion being celebrated on the cruise, as you can see in the photo below. I found this article about a family reunion cruise online. Yours could make the papers too! "Jamaica Observer" Newspaper article Jan. 2009"
The First Annual Fenton Family Reunion and Friends Cruise 2009, which took place in the form of a six-day western Carribbean Cruise from Sunday, January 11 to Saturday, January 17, aboard the Carnival Cruise Line, docked in Ocho Rios yesterday at 7:00 am. The reunion was the brainchild of Thomas Downer, owner of The Rise-n-Shine Travel Agency in the United States, and local business man Harry Morrell. 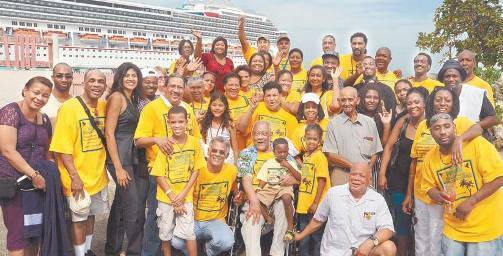 The 87 Fenton family members from Jamaica, England, Canada and even as far as Australia, gathered at Oceans 11 on Fisherman's Point Road for a meet and greet with family members who were unable to make the cruise. They are seen here surrounding the eldest male member of the Fenton family (seated in wheelchair) 78 year old Selbourne Fenton who celebrated his birthday last week Wednesday. Other family reunion ideas can't compare with a cruise!